Archaeologists have found something similar to braces on ancient mummy remains which indicates the beginning of an orthodontics science. Ancient Egyptians used rudimentary braces consisting of crude metal bands and catgut, which were believed to provide pressure in order to move teeth. 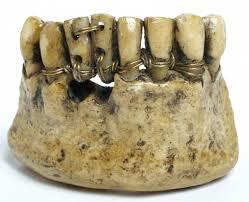 Orthodontics is derived from two ancient Greek words: 1. Orthos: Straight/Correct, and 2. Odontos: Tooth. Pierre Fauchard, the famous French dentist, known for writing the first complete scientific description of dentistry, published in 1728, credited as the “Father of Modern Dentistry” developed the “Bandeau” (later known as expansion arch) that was used to expand the arch. This “Bandeau” was consist of horseshoe shaped strip of precious metal to which teeth are ligated; this became the basis of Angle’s E arch. Dr. Edward H Angle known as the father of modern orthodontics was the first to limit his practice to orthodontics. The American Society of Orthodontists (now the American Association of Orthodontists) was established by him; he became its first president. softness and the ease of adjustment when exposing to heat. The actual technique and devices used in orthodontics advanced considerably during the 20th century. Between 1970 – 1990, the concept of invisible braces was of great interest. In 1997, two MBA students create a business plan for what would later become Invisalign. Chishti and Wirth co-founded Align Technology developed a new generation of high technology orthodontic products, known as invisalign which became available to the public in 2000. In the past, orthodontic treatment was mostly for the wealthy people or those who had an extreme deformities of the teeth or jaws. However, today orthodontics is not considered a luxury procedure; most kids, teens, and adults to create beautiful smiles and improve their dental health and self-esteem choose to start their orthodontic treatment. Correcting misaligned teeth can often prevent a lifetime of periodontal problems and severe tooth wear. Since the first use of a small catgut cord to slowly shift the teeth into proper alignment, braces have come a long way. There is still room for growth in the world of orthodontics. Advancements will decrease the length of treatment and cost, so people seeking orthodontic treatment will increase. Modern orthodontic practices have evolved considerably over the last 20 years. NASA discovered a special heat-activated, nickel-titanium metal that can be molded into a small wire and improve the alignment of teeth in the mouth. Moreover, could eliminate patients’ visits for adjustments. This could be the next advancement in orthodontic world. DO YOU OR YOUR CHILD NEED AN ORTHODONTIC TREATMENT? If you or someone in your family and friends is considering orthodontic treatment, contact our office for a complimentary consultation session at 289 588 8747. At York Orthodontics we offer the latest in leading edge orthodontic treatment to help you create the beautiful smile we all deserve.